McCloud River Railroad; History: 1900-1920. #8 with a log train on a trestle about two miles east of Bartle. Two different classes of railroads were built in the McCloud operations, those lines built for the benefit and exclusive use of the lumber company, and those that became part of the common-carrier McCloud River Railroad. With a few exceptions, almost all of the common carrier tracks east of McCloud consisted of logging lines that became permanent. Most of the trackage used by the McCloud companies consisted of temporary log spurs laid down by the lumber company to reach the area that was being logged at the moment, and in most cases the trackage was removed as soon as the trees were gone. In a few places a long-lived trunk line that was fed by numerous spurs developed, and some of these were made part of the common carrier operation if revenue (or potential revenue) for something other than lumber company logs existed. 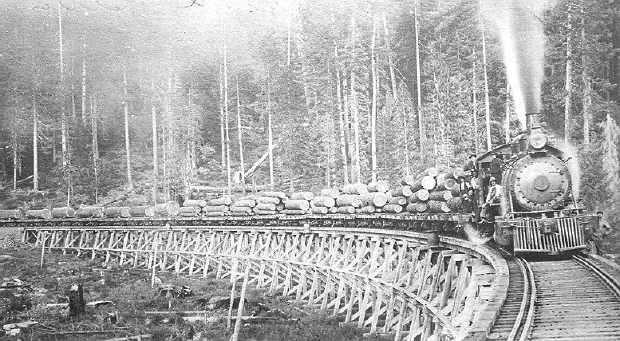 In the early years the railroad owned and operated the logging spurs on the behalf of the lumber company. Many hundreds of miles of roadbed laid out by and for the lumber company still exist winding through parts of Siskiyou, Shasta, and Modoc counties, but only a few dozen miles would be operating at one time. The first of these spurs were laid out directly from McCloud to tap stands of timber within the first year of operations. Traffic on the McCloud River Railroad could be broken down into three basic categories. The first was movement of raw logs from interchanges with the lumber company railroads to the McCloud mill; the second was movement of commercial freight between points on the railroad; and the third was passenger service. Commercial freight generally meant finished lumber from the McCloud mill (and other mills in later years) to connections with the outside world as well as whatever other traffic that was offered to the railroad by members of the general public. A sidenote to the passenger traffic was the less-than-carload freight and express business that was generally carried in the same car as the passengers. Wells Fargo and U.S. Mail contracts both made their way onto McCloud rails in the first several years. A little over thirteen miles northeast of McCloud lay a small mill known locally as the Holbrook Mill. The mill was built in 1891 and had operated sporadically since, mostly due to the lack of decent and affordable transportation. The McCloud River Lumber Company purchased the sawmill in late 1897/early 1898, and by late 1898 the first eastward extension of the McCloud River Railroad was being constructed towards the mill. 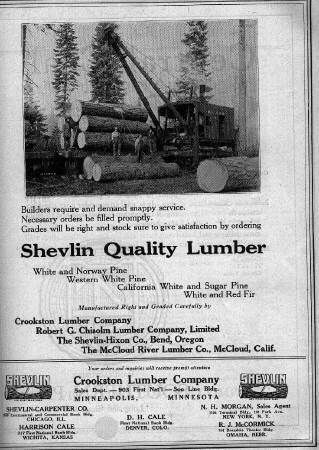 The McCloud River Lumber Company re-named the operation as the Ash Creek Mill. Much money was poured into the operation, and by the time that the McCloud River Railroad completed construction to the mill in 1899 it was a first class sawmill. Combined daily output of the two McCloud sawmills amounted 300,000 board feet. The McCloud River Railroad commenced construction of a second line eastward out of McCloud in 1900. The new line was headed more or less for the small settlement of Bartle, located about 18 miles east of McCloud. Bartle dated from 1887 when the Bartle brothers established a cattle ranch in the area. The ranch was the only real semblance of civilization on the rough stage roads that passed through the area on their way from Sisson to the rich agricultural areas of the Fall River and Big Valleys to the southeast, and before long a fine hotel was built to house and feed travelers. A post office known as Glazier was established in the late 1800’s, and a newspaper, the “McCloud River Pioneer” was published here between 1889 and 1893. The McCloud River Railroad was having trouble purchasing enough rail to keep up with the expanding system, and a partial solution was found in the moribund Red Cross Lumber Company railroad south of Sisson. Red Cross had operated a succession of two small mills along the McCloud River near Bartle and had started construction of a railroad from a point on the Central Pacific south of Dunsmuir towards the McCloud country. The company fell apart with two and a half miles of rail down, and the McCloud River purchased the Red Cross railroad for the rails involved. The company immediately moved to salvage the railroad, and the rails were brought to McCloud for re-use. The year 1902 saw an ownership change in the company, as George Scott and William Van Arsdale sold the company to a group of Minnesota capitalists. A man named J. R. Wisdom soon arrived in McCloud to become general manager of the two companies. The new owners brought new capital to invest in the operations. One of the first acts was to eliminate the switchback at Big Canyon through construction of a large fill. The following year saw the Ash Creek Mill destroyed by fire. The company decided after some deliberation not to re-build the mill. Some of the Ash Creek line was retained as log spurs for several years until the forests in the area were cut out. The McCloud River Railroad next concentrated on reaching Bartle. The railroad arrived there in 1905. Bartle became the transfer point for goods and people heading to and from the Fall River and Big Valleys, and before long large freight sheds were constructed to handle the interchange of traffic. Construction of the common carrier did not stop at Bartle. By the end of 1905 the railhead reached 3 miles beyond Bartle, heading in a northerly direction. The city of Klamath Falls was offering a substantial amount of money to the first railroad to be completed to the city, and several people saw the northward direction as a sign that the company was entering the race. Klamath Falls was a mere 75 miles from Bartle (50 miles by land plus an additional 25 miles by steamship across Lower Klamath Lake). The year 1906 saw a few developments in the railroad. The railroad had leased space in the Southern Pacific headquarters building in San Francisco for its general headquarters for several years. The great earthquake on the morning of April 18th destroyed the SP building, along with all records of the McCloud River Railroad. Despite the loss, the re-building of San Francisco greatly increased the demand for McCloud forest products. Construction of the railroad beyond Bartle continued, with a new terminus named McGavic (15 miles from Bartle) reached. McGavic turned out to be as far north as the railroad would ever get. The lumber company did build several spurs north of McGavic to reach harvest areas. The year 1907 saw a change in the western terminus of the railroad. Sisson donated some land to the company, and in return the railroad built a new line from a point above Sisson into the town, where a new interchange point was established with the Southern Pacific. The original line to Upton was immediately abandoned. A further abandonment occurred the following year when the 3.5 miles of track south of McGavic was abandoned and removed. The year 1914 saw another shift in ownership of the railroad. The railroad had been almost completely controlled by the lumber company for many years, with the lumber company holding 11,975 of the 12,000 authorized shares of McCloud River Railroad Company stock. The lumber company decided to divest itself of the railroad, in part to avoid any appearances that the lumber company might be in a position to exert undue influence in the affairs of the railroad. To accomplish the ownership shift the lumber company turned the railroad stock directly over to its own stockholders. The railroad thus became an independent property owner in McCloud, but its employees continued to live in lumber company housing and continued to enjoy all of the rights and privileges that the lumber company extended to its own employees. The railroad remained basically stable through the 1910’s with the exception of the ever changing log spurs. Logging activity at the time was centered in the areas south of McCloud, between McCloud and Bartle, and north of Bartle. The area in the vicinity of Black Fox Mountain was the center of operations beginning about 1911. The McCloud River Railroad was (along with all of the nation’s other railroads) taken over by the United States Government during the first World War. The takeover had almost no impact on the road. The year 1919 saw a new agreement struck between the railroad and lumber companies over operation of the non-common carrier log lines. Since the inception of the company the railroad had built and operated all of the log lines on the behalf of the lumber company. The new agreement transferred all construction, operation, maintenance, and removal of the logging lines from the railroad to the lumber company. The actual rails used in the logging trackage were still owned by the railroad but leased to the lumber company. The lumber company acquired a fleet of small Plymouth gasoline-powered switchers that were used in construction and removal of log lines and movement of light log trains, with leased steam locomotives used to move heavy trains. The McCloud River Railroad did not operate beyond the limits of its common carrier tracks after 1919.